Last summer (2007) I spent a few months in the Solomon Islands, teaching on a remote island with no electricity or running water. See my post here for more. These seem to be the staple meals we ate. 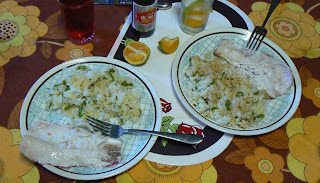 We usually had some fish, with rice and green peppers, spring onions and a generous amount of soy sauce. Other days it would be rice with tomatoes, aubergines, tuna and spring onions. Others it would be rice, green peppers, onions, aubergines and tuna. You get the picture. The noodles we had were usually put into a pan uncooked, with a sliced onion and then a tiny bit of water added and then covered and stirred every now and then for about 10 minutes. Soy sauce was thrown on top along with some spring onions and chilli. It took ages for me to work out how they’d made the noodles cooked yet so dry and the trick was using the noodles from an uncooked state. This was delicious with fish, and one time we were cooked for oysters were added which made a tasty change. One thing I really liked on the island was fish cooked in cocout milk with cabbage and spring onions. It was particularly good with barracuda, but the best was with giant clam (which was so soft it melted away in the mouth). Unfortunately not a sweet course. If you wanted sweet, you choose between papaya, pineapple, banana, star fruit, melon with bush lime (the weird orange on the inside one) squeezed on top. Pudding seems to be applied to a dish where a vegetable has been boiled and mashed and then baked. We had taro pudding with baked tuna at the custom dance (below). 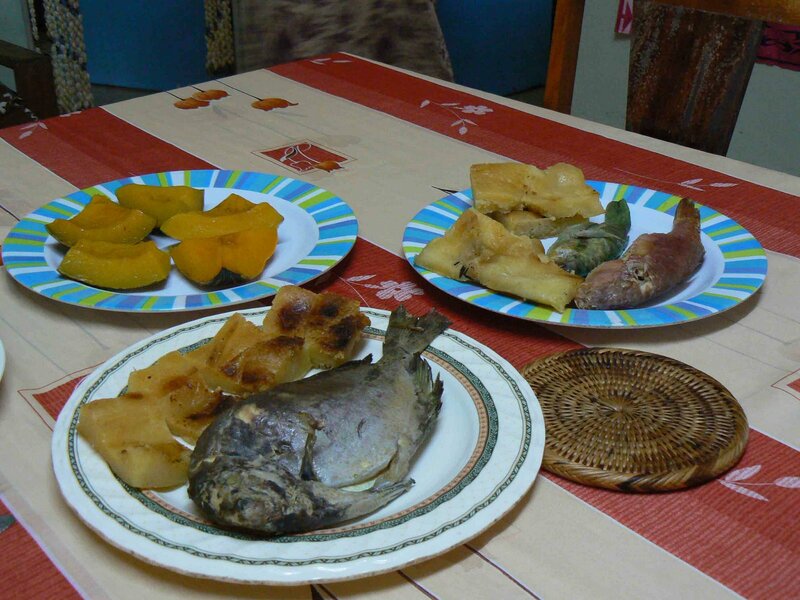 The other sort of pudding is cassava pudding which is usually served with reef fish. Cassava is a type of sweet potato that grows on Santa Cruz Island and again the potato is boiled then combined with coconut milk and baked. Cassava pudding was an improvement on taro pudding as it had a far more agreeable texture. I mentioned to my students I’d had pudding and they were very impressed – you’ve not had the island experience till you’ve eaten pudding and fish. The reef fish, unlike the deep sea fish, are baked whole and you pick the flesh from the bones. The deep sea fish (tuna, snapper, barracuda) are lopped into portions and cooked in a stew usually. One day Julie (the doctor’s housekeeper) cooked something she called ‘Pumpkin Cheese’ in front of me and I took notes. It seems like a pumpkin pudding, using the island definition of pudding. Because I watched and it was cooked in a way very different to how is possible at home it’s taken a few tries to get it 1) right 2) authentic. I’ll post up the recipe when I get it right!